Like any crop, algae must be continuously monitored to understand their growth, composition, and purity properly, so having a method to rapidly characterize these subvisible organisms is extremely important. This can be accomplished using different methods, including microscopy and a variety of laboratory instruments that can count, size, and even image particles. Until recently, the only way to characterize algae was through manual microscopic analysis. This process is labor intensive and requires skilled operators to interpret the imagery. It is not possible for a microscopist to analyze statistically significant population samples in a timely fashion. To overcome these limitations, new particle analysis systems were introduced, including Coulter counters, laser diffraction systems, and light obscuration system. They typically operate on a volumetric based measurement principle. This indirect method involves measuring the signal that is proportional to the particle’s or cell’s volume. By comparing the signal produced for the cell/particle against the signal produced for traceable standard particles, you can infer the volume of the unknown particle being measured. Since the aim is to have a single measurement of particle size for each particle, an assumption is made that all particles (including the standards) are perfectly spherical in shape. The system’s software then converts the calculated volume for each particle into an Equivalent Spherical Diameter (ESD). When ESD is plotted against frequency or percent volume, the resulting metric is called a particle size distribution (PSD). These types of systems can measure and analyze thousands of particles in minutes, and calcuate particle size distributions of algae samples much more quickly and with a higher degree of statistical significance that previoulsy possible through traditional microscopy. The problem with volumetric-based measurements for algae characterization is the assumption that all particles are spherical in shape. While for a known homogeneous sample this is fine, most samples in the real world are heterogeneous in nature, containing many different types of particles or species of algal cells. Although generating a PSD is simple, there is no way to differentiate what the distribution actually consists of, and in fact three very different species of algae could be reported as identical in a PSD. So, if actual characterization of cell types in a sample is important, as is true with algae applications, then these volumetric techniques are not usable. Then came dynamic imaging particle analysis (DIPA). DIPA systems, like the FlowCam, use dynamic image acquisition to image large amounts of sample moving past the microscope optics. As each particle image is acquired, measurements (more than 30 potentially) of particle morphology such as length, width, ESD, and circularity are stored in a spreadsheet and indexed to the image in real time. Gray scale measurements such as intensity, transparency, and color information are also stored for each particle. Post-processing of data is easy with the accompanying VisualSpreadsheet software, which allows the operator to perform spreadsheet operations on the data, such as sorting and filtering particles based on any of the measurements (or combinations of measurements) acquired for the particles. DIPA enables the algae grower to analyze large, statistically significant populations of algal cells rapidly in an automated fashion. Not only can this technology count algal cells, but through its use of imaging it can also analyze each cell to determine its type. Since most algal stocks are monocultures, this analysis is critical for characterizing the purity of the stock, and for identifying predators such as rotifers that will feed on the algal stock. 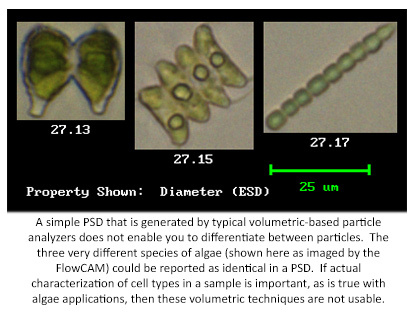 DIPA systems such as FlowCAM offer a powerful tool for algae analysis in industrial biotechnology applications such as algal biofuels, chemical feedstocks, nutraceuticals, and fertilizers. Different applications require the extraction of different types of biomass from the algae stock, such as lipids, oils, pigments, and proteins. Depending on the application, different species of algae are found that optimize the yield of the specific biomass desired. Once the desired feedstock is found, high capacity production methods are used to produce harvestable amounts of algae stock for the application. These may be monocultures or mixes of several different species. Students in the Marine Sciences Department at the University of New England (in Biddeford Maine) are using the FlowCam to understand the relationship between phytoplankton species Dunaliella tertiolecta and Tahitian Isochrysis galbana (two species that they routinely culture in the phytoplankton lab), in nutrient-limited and nutrient-rich environments. Regardless of the types of algae being produced, it is critical to be able to characterize the composition of the feedstock in terms of species content, size distribution, and health. 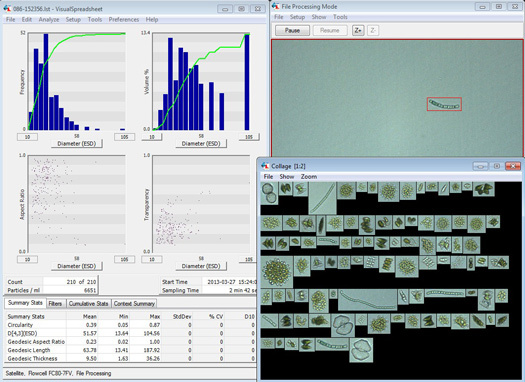 The below figure shows several different algae species automatically analyzed by FlowCam and its software. The various species of algae were automatically characterized using user-defined software filters. 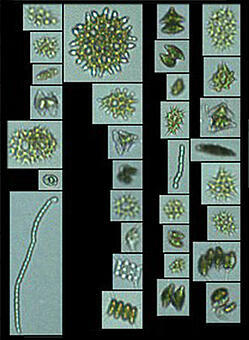 The FlowCam can perform this analysis on thousands of algae cells per minute. DIPA systems are currently in use both in research and development and in production environments within the algae technology arena. In R&D, the systems are especially useful for identifying the characteristics of different algae species in order to optimize the desired yield. Some very interesting work has involved the use of staining and fluorescence to quantify lipid content in different species, which is a key parameter for assessing the efficiency of using algae as a source for biofuel. An important area of research focuses on the extraction techniques used to harvest the oils and algal biomass from the feedstock. It is critical that extraction methods in development use the least amount of energy possible, and DIPA technology is a valuable tool for measuring this efficiency. In algaculture production systems, particularly open ponds and raceways, the need to monitor for contamination by predators, other algae species, and bacteria is paramount. DIPA provides a high speed, automated strategy for on-line analysis of the feedstock. Dynamic imaging particle analysis (DIPA) is a powerful tool for detecting, identifying, and quantifying subvisible particles for a variety of applications. Learn more in our free eBook, the Ultimate Guide to Dynamic Imaging Particle Analysis!